The Watts Gallery may be familiar to those of you who watched BBC2's Restoration programme last year. 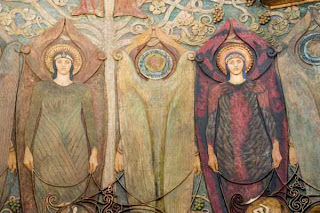 The Gallery is a museum dedicated to the work of Victorian painter and sculptor George Frederic Watts– the first (and now the only) purpose-built gallery in Britain devoted to a single artist. It is still very much in need of funds to safeguard it's future. If you would like to help please go to The Watts Gallery link (on sidebar) and click on The Hope appeal. Thank you. There is another building close by connected to the Watts family and if you are ever in the area do go and visit. You will be enchanted. This is the beautiful Watts Cemetery Chapel at Compton in Surrey. 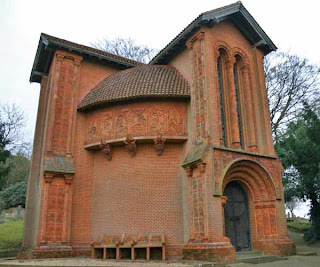 It was designed by Mary Watts, wife of George Frederic Watts in 1895 and built from local clay under Mary's guidance by the villagers of Compton. George and Mary were dedicated supporters of the Home Arts and Industries Association which aimed to revive the dying art of handicrafts among the working classes. The Chapel is a unique Arts and Crafts community memorial. 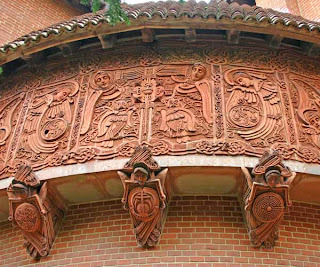 The exterior is amazing with terracotta relief friezes, inspired by patterns from celtic art, softened with art nouveau forms and full of symbolism. Standing inside the small mortury Chapel is overwhelming and extremely moving. It is covered in gesso panels in reds, blues, greens and golds of angels, cheribium, and intertwined with swirling tendrils of the Tree of Life. Along the lower half of the walls are flowers - 'the gifts of nature' which were all painted by local children. 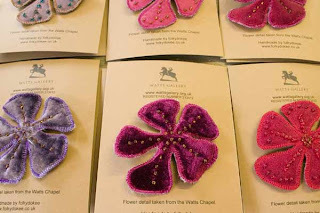 It is these flowers and motifs from inside the Chapel which have inspired some new brooches which are to be sold in the Gallery Shop. We have been making them up this week and are really pleased with how they have turned out. We are also working on more designs including some sumptuous handbags, which i can't wait to do. It's always good to stretch ourselves in slightly different areas as it leads to new possibilities. They are having a fete this Saturday so hopefully they will sell well for them. We have also been making up some of our own little flower brooches, cards and hairbands this week as we are doing a local fundraising craft evening tomorrow night in aid of Chase. Although we are working tomorrow evening ( not really work.. more social ), Friday is usually our day off from the Studio. We will still meet up though in the morning for yoga. I am starting back tomorrow after .. hmm.. about 4 years off.. bad girl. Know it will do me the world of good and will hopefully help me relax as this i often find hard to do. My little mind is always busy. Must go and rest it now on a big squashy pillow. I remember the Watts Gallery from my previous life as an art gallery curator. It was at the fund raising point then and one of my colleagues was involved. It is good to see it all restored. I particularly like the spiky flowers, your brooches work so well I think because they capture the movement of real flowers. What an interesting post. You certainly seem to have been inspired by your visit. 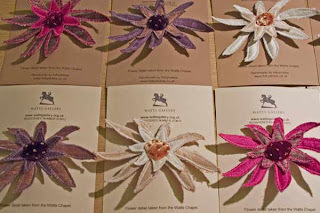 The brooches are really lovely. Take it easy with the yoga - it is easy to overstretch, especially if it has been a while since your last class. Enjoy the fair and the rest of your weekend. Your brooches are beautiful! Hope you have a great weekend and good luck with it all! Hi Ginny, I've just discovered your blog via your comment left on Cupcakes at Home, funny how we stumble across new blogs! I've added it to my favourites list, I'm looking forward to reading more.